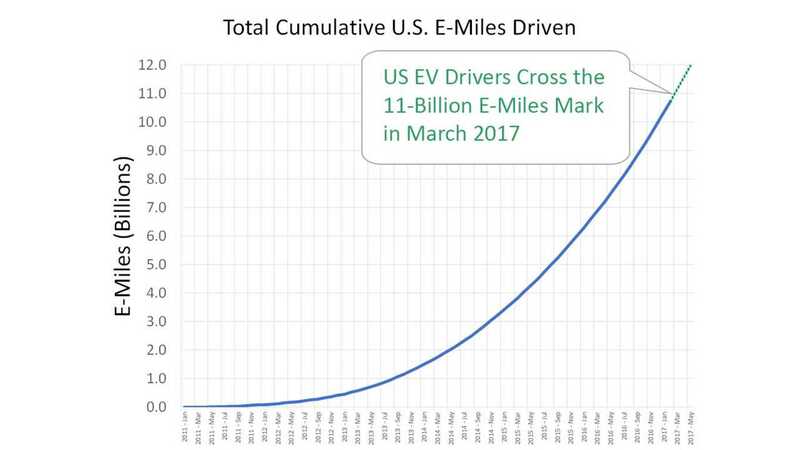 US Crosses 10 Billion "E-Miles" Driven - Facts and Graphs product 2017-04-09 16:40:47 https://insideevs.com/news/333418/us-crosses-10-billion-e-miles-driven-facts-and-graphs/ General, plugless, u.s.
Plugless recently released an interesting report on the estimated cumulative miles driven for all plug-ins in the U.S.
As it turns out, we are entering 2017 with ~10 billion all-electric miles driven. 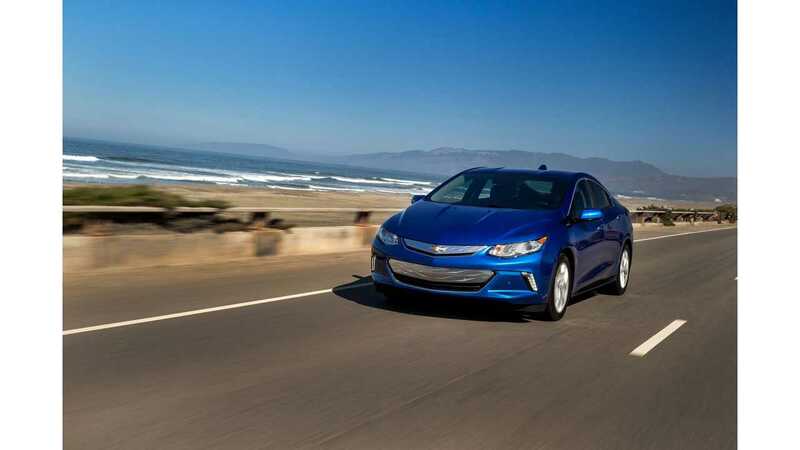 Nearly 80% of the mileage was covered by the three most popular models - Chevrolet Volt (3 billion), Nissan LEAF (2.9 billion) and Tesla Model S (2.2 billion). "Sometime around the New Year an EV driver silently drove the 10 Billionth U.S. e-mile (since 2010). Just three months later, if it hasn’t already happened, the 11 billionth e-mile will be driven." Our thanks to Plugless for putting together this data and graphics, so why not check out the company's aftermarket wireless charging products for the Tesla Model S, Nissan LEAF, Chevy Volt and BMW i3. "The modern era of electric vehicles was kicked off in earnest with the roll out of the Chevy Volt and Nissan LEAF in December of 2010. At the time, a silicon valley start-up called Tesla (née Motors) was rapidly building up to the release of its industry-changing Model S. Since then, members of that trio, the “Big 3” of EVs, have led the way in the EV market in the U.S. and dominate the total e-miles driven accounting with a full 76% of all electric miles. Here’s how our estimated numbers shake out. 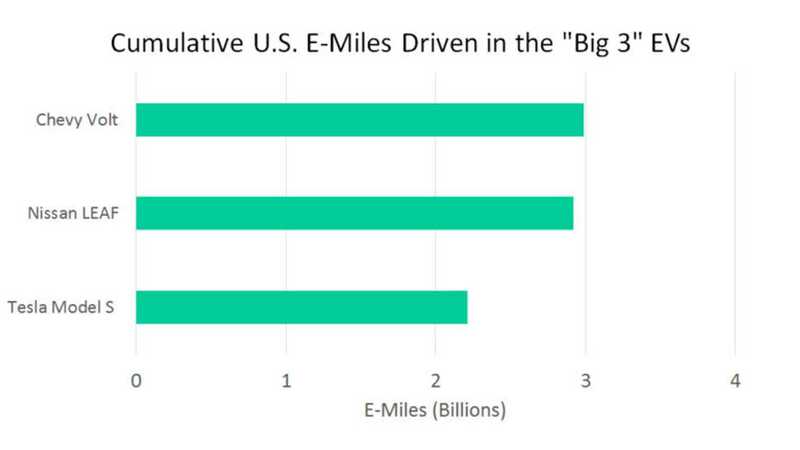 As of February 2016 the total number of e-miles driven is about 10.7 billion. And since more than 300 Million of those e-miles were driven in February alone it’s likely that the 11th billionth is happening right about now (late March 2017)." The Chevy Volt has accumulated about 3 Billion of those miles (Gen 1 ~2.8 Bn and Gen 2 the remaining 200+ million e-miles). 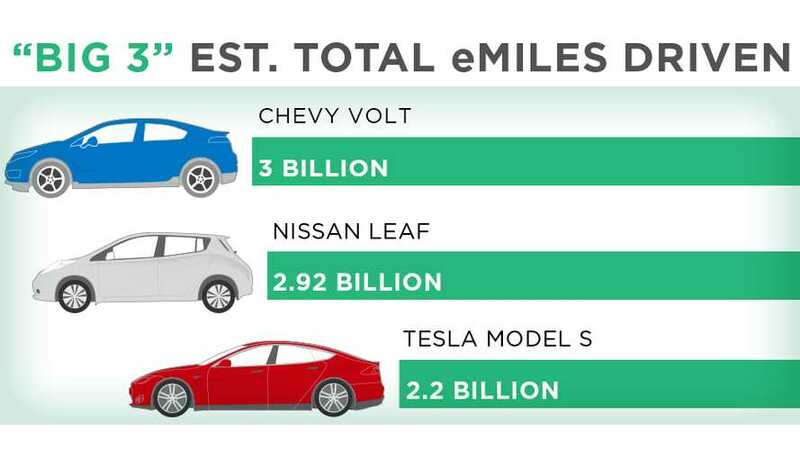 Nissan LEAF has an estimated 2.92 Billion e-miles and Tesla Model S drivers are at about 2.2 Billion e-miles. We did account for the Volt and other PHEVs hybrid fuel nature. Below is a table of e-miles per month by EV model. Estimates are based on data from studies out of the Idaho National Laboratory and the California Air Resources Board as well as some OEM data. Check our methodology here and we welcome corrections and improvements to our estimates. While the Volt and LEAF total cumulative miles are essentially a dead heat, why is the Tesla Model S, with its longer range (which seems to account for a larger monthly e-miles driven) lagging? It’s just a matter of time. 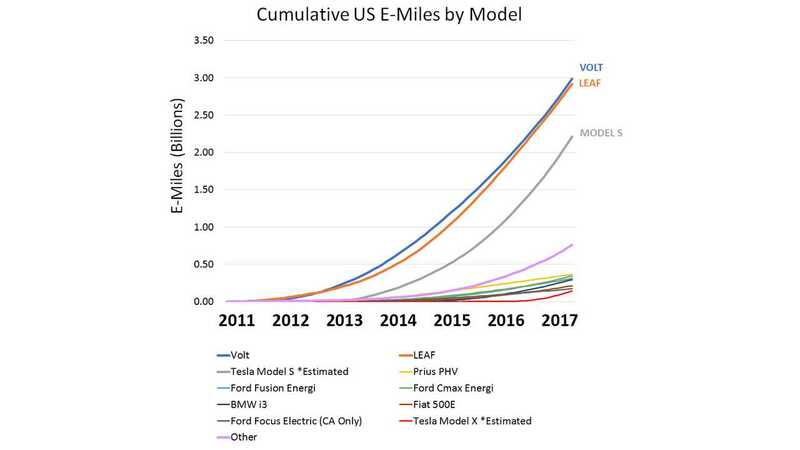 Volt and LEAF sales began a few years ahead of the Model S and this chart shows the Model S tracking at roughly the same curve just two years later. More details here. 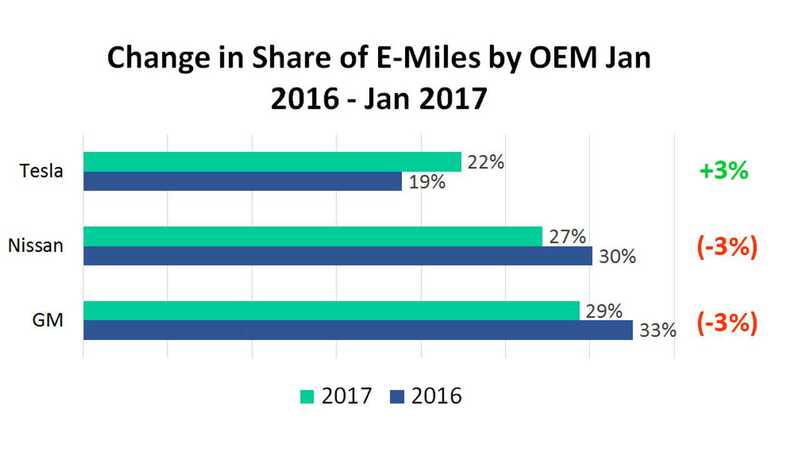 Taking a look at the EV fleets by manufacturer GM and Nissan have racked up e-miles at about the same rate since 2012. With the combination of Tesla Model S and Model X (and peppering in the Roadster miles), Tesla is poised to rapidly overtake the lead. 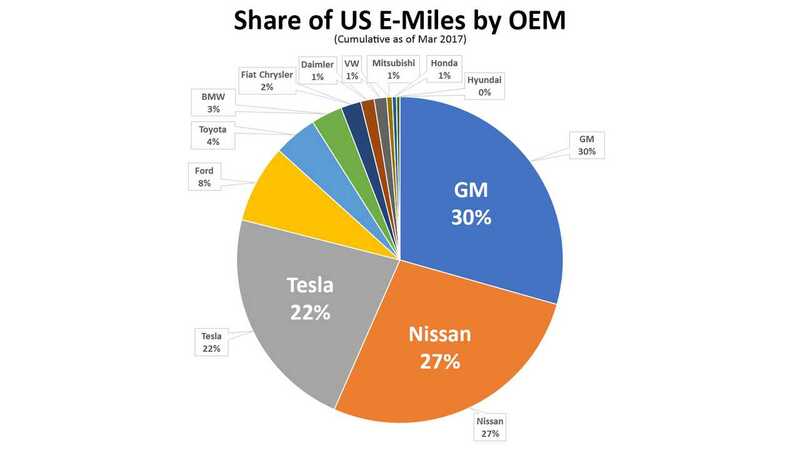 It gained 3% in share of total US e-miles between January of 2016 and 2017, while Nissan and GM’s share each shrank by 3%. Out of every hundred miles driven on electricity in the US, 22 have been in a Tesla of some kind — either Model S, Model X, or Roadster. Not bad considering the 178 year combined lead that Nissan and and GM have on Tesla in automaking experience. Elon Musk should learn the MC Hammer dance because no one will be able to touch Tesla on e-miles driven by 2018. Chevrolet’s Bolt is projected to sell 30k over the course of 2017. Tesla is projecting a 50% increase in Model S and Model X sales. If Tesla sales come anywhere near those numbers, as they have in past years, it will keep the electric car company well ahead of Chevy. And that’s not counting the 50k+ Model 3 US deliveries predicted by Musk in 2017. We believe transparency is good! See more on our data, sources and methodology here.